Art. What does that little word mean? It can encompass a huge variety of pursuits, from drawing to dance, from sculpture to movie making. The one thing all artistic pursuits have in common is that they involve some sort of creation – making something that didn’t already exist. As you may remember from our study of the Tendencies of Humans, one thing that sets humans apart is our ability to envision something that doesn’t yet exist. Bringing it into existence makes you feel powerful and in control. It’s no wonder that little kids love art! How can we best help kids to create art? I think it’s like any other skill: begin with the basics. Once basic skills art established, kids can move on to more complicated activities. But if you start with the complicated activities, frustration can ensue. Keeping it simple at first is best. In many preschool classrooms, art has its own separate area. Often, it’s near Practical Life – since Practical Life is often by a sink, this makes sense as far as clean up goes. If there isn’t a separate art area (although I think there should be), there are usually some art activities integrated into Practical Life. 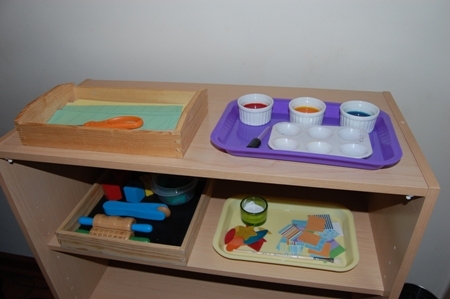 What can go in your preschool art area? All of the above activities can be shown to children just like any other presentation would be. You can sit with the child (or a few children) at a table and go through the work, step by step. Some kids will need more help or instruction than others. As you can see, most of these activities are meant to teach basic art skills like how to hold a paintbrush, gluing, and cutting. I think it’s important that these are available throughout the year, but you’ll want to provide the kids with more challenging activities as the year progresses. Besides the art activities that should be integrated in the classroom, time should be taken to provide the kids with art materials for doing specific projects. I enjoy using Friday afternoons as a designated “art time”. It’s a nice time to do projects like tissue paper art, papier maché, crayon resists, clay projects, and more. Some Montessorians frown on the idea of giving kids a specific art project (like making a paper plate ladybug, for instance). They only want to provide kids with the raw materials and not tell them what to make. I like to do both; kids learn the valuable skill of following directions when they do pre-planned crafts. Also, pre-planned crafts can be more complex and tie in with seasons or other themes. Let Out the Sunshine: A handbook featuring a Montessori approach to creative activities, this book contains simple projects that highlight the five basic skills of cutting, gluing, modeling, crayoning, and painting. Art for the Montessori Classroom: A guide from New Child Montessori, this more complex book has 240 pages of information for setting up the art area and integrating art into the classroom or homeschool curriculum. In addition, there are many books available at teacher stores and even traditional bookstores that are filled with arts and crafts ideas. I think most of these can be worked into Montessori with no trouble at all. In this earlier post on art and children, I include lots of links for art websites, instructional books, and other resources.